Dr. Thirkannad graduated from Bangalore Medical College, India in 1991. He subsequently completed his Residency in Orthopedic Surgery in 1996 where he was awarded the Lupin Gold Award and Natarajan Gold Medal. He obtained a Masters Degree in Orthopedic Surgery in 1996 and was certified by the National Board of Examinations in 1997. He completed a Fellowship in Hand and Microsurgery from the National University of Singapore in 2003 and from the Christine M. Kleinert Institute for Hand and Microsurgery in 2004. 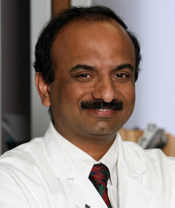 Prior to his arrival in Louisville, Dr. Thirkannad was an Assistant Professor and Board Examiner in Orthopedic Surgery at the Rajiv Gandhi Health University, Bangalore, India. He is currently Associate Clinical Professor in Hand Surgery (General Surgery) as well as Assistant Clinical Professor of Orthopedic Surgery at the University of Louisville. He is a member of many Orthopedic and Hand Societies, including the American Association of Hand Surgeons, American Association of Orthopedic Surgeons and has served on the Executive Council of the Indian Society for Surgery of the Hand. He has published articles in peer reviewed journals and has authored chapters in text books, including Sabiston’s Textbook of Surgery. His special interests include wrist injuries, rheumatoid arthritis, congenital hand deformities and microsurgery.